Paul van Dyk has been confirmed as the headline act for this year’s Peace One Day concert. 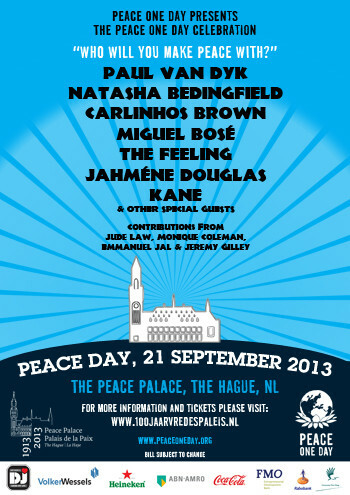 Following Sir Elton John’s performance at the 2012 Wembley Arena-based event, this year the Peace One Day organisation have been asked to bring their annual celebration to The Hague to mark the 100th anniversary of the Peace Palace. Taking place on 21st of September, the German GRAMMY Award nominated musician will be joined by an eclectic, all-star line-up. Also confirmed to appear are award-winning British singer songwriter Natasha Bedingfield, Oscar-winning Brazilian legend Carlinhos Brown, Spanish superstar and GRAMMY Person of the Year Miguel Bosé, BRIT award-nominated British band The Feeling, UK X-Factor runner up Jahméne Douglas and Dutch rock band Kane. The concert will be the highlight of Peace One Day’s 24 hours of broadcasting on Peace Day on YouTube.